The source document referred to under the 'Group' description gives this picture the caption: 'Alness, near Base 17'. 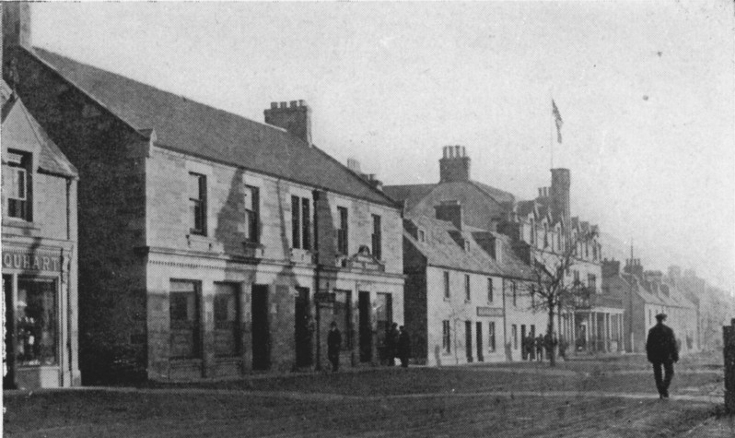 This is Invergordon High Street with the Royal Hotel on the right, flying the flag. Never noticed this before. Despite it being taken 26 years before I was born in the town it's instantly identifiable with how things looked when I was young. (Apart from the lack of pavements!) It looks a bit driech but then it often was and is one of the reasons I don't live there now. Yes, this is the part of the High Street I remember with part of Urquharts shoe shop then after the lane Mackenzies grocer (my Great Uncle, Big Dave) the Billy Clark's shoe shop and after that Lane....Nonnie's Fancy Goods Toys etc. Urquharts is now Boots the Chemist and the Grocers is now the Co-op. A solicitor occupies the next building and sadly the building after that and the hotel are now gone. Hello Bill. It may have been a bit driech, but it take a fair bit to measure up to the views. Some of the photographs are good examples. It's too bad we can't make out the other signs. You're right Eddie and everyone had to (more or less) get on with everyone else. I have lived in much bigger places but I guess I never knew so many of the locals! Invergordon is not that driech. My daughters loved spending their Summer holidays with their Nanny Geddes and when they came back to Dundee I have the photos to prove they all came back with lovely sun tans. They loved the freedom they experienced on their holiday in Inver G.
Hi Liz and Jeanette Ditto your comments about Invergordon. Jeanette and Bill I remember sometimes arriving at your parents house at breakfast time after a hetic night of "first footing". They were always so pleased to see us. Great days !!!!! Rosalie, I have many (hazy) memories of Hogmanay at our house. My dad was such a gregarious man there was always strangers coming around. I remember him making friends with a black travelling salesman who sometimes stayed with us. I remember feeling proud that such an exotic person had been in our house. Changed days! For the life of me I can't remember the name of the tobacconist that was next door to Urquhart's. I should though, can anyone remember? Not quite next door to Eric Urquhart, but Mr Logan and his wife ran a tobacconist and sweet shop near there. Thanks Ron, I remember it was a very small shop with a sweet aroma. Used to get a packet of 5 Woodbines back then and your age didn't matter. Logan's shop was between the existing paper shop and the shoe shop. It was later to become JF MacKenzie's, my eldest brother who married the Logan's daughter Jennifer. It then became Dalgarno's the butchers for many years before Fraser Sports. Lately seems to be a series of arty/fancy goods shops. You are right Harry was very small with if I remember rightly a step down and seemed to be very dimly lit. My brother Ian added an extension out the back towards Joss Street in the early '60s. Graham, was there not a small shop between Logan's/Dalgarnos and Urqhuart's the shoe shop? I remember the step down to Dalgarno's and it was dark, but I seem to remember one of the Harbour Masters and his wife had a material shop for a while beween the other two. Eddie... My description was a bit misleading. I was describing Logan's as between the current paper shop and the current shoe shop. The current paper shop I refer to is the shop previously known as WH George/Bill Leslie and the current shoe shop is in the premises previously occupied by the material shop you mention. Eric Urquhart's shop was further along at the end of the next block going east now occupied by Boot's the Chemist. That is if my memory serves me right! You are correct Graham, the tobacconist was directly across the street from Mac's cafe. We are talking the '40s and '50s. I'll go for the late '50s but you got me on the '40s Harry !!! Good one Graham, ok then me the '40s and you the '50s. Hi Graham, I just drove up the High Street on Google to see which building was which. Took me back a few years, but the shops have changed, even my old home at No. 32. Still looks a nice High Street, for with all the changes. Hi Eddie, Google Earth is amazing and a bit mind boggling, I'm always amazed by it. Your comment got me to thinking about the High Street and the changes in the businesses since say the mid '60s when I left the town for about 12 years. I was trying to work out what shops/services are still carrying out the same type of business that they were in the mid '60s and I could only come up with two. The Royal Bank (previously National Commercial) and the Commercial Bar and even that is no longer operating directly onto the High Street. Bill Leslie's newsagent is now occupied by a mini supermarket which does sell papers so maybe that counts as a third; cannot think of any others at all who are carrying out the same business. Maybe you could include the Police Station but seldom manned these days. Changed days indeed but the High Street is still visually nice as you say if functionally questionable! My husband Joseph Ross once worked on the fountain on the High Street with Charliie Winters when it was damaged. They worked for Ross & Ross, builders in Alness. Mary, did Charlie come from Alness too and did they install the new tile fireplaces in the council houses in Invergordon? Charlie came from Alness, Joe was born and lived at Hillhouse, Saltburn till he left in 1961. We moved there in 1973 for - a short time, and went back in 1977. Left again when the work dried up in 1989, so no he didn't put the fireplaces in council houses, maybe this Charlie did.